A planned census of Nepal’s greater one-horned rhinoceros will not take place this year due to a lack of funds. Revenue from ticket sales at national parks is divided between the government’s general budget and funds to support local communities, leaving wildlife officials dependent on donors to finance activities like the census. This year’s census was believed to be particularly critical because large numbers of Nepal’s rhinos are dying due to unexplained or natural causes, prompting questions about the carrying capacity of Chitwan National Park, the country’s rhino stronghold. Experts believe a census this year could reveal a decline in population, a politically unpalatable outcome in a country where rhino conservation is a matter of national prestige. KATHMANDU, Nepal — A planned census of Nepal’s greater one-horned rhinoceroses (Rhinoceros unicornis) will not take place this year. “The count has been postponed,” Bishnu Shrestha, a spokesman for the Department of Wildlife and National Parks, told Mongabay. Only 60 percent of the necessary funds were raised, he said. 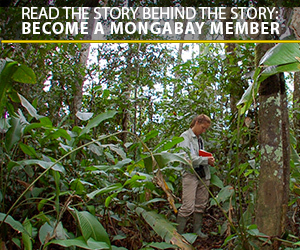 Conducting an accurate count of rhinos is a massive undertaking. The previous census, conducted in 2015, involved 267 people and 54 elephants. This year’s operation was expected to cost around 10 million rupees ($100,000), Man Bahadur Khadka, the director-general of the Department of Wildlife and National Parks, told Mongabay last week. 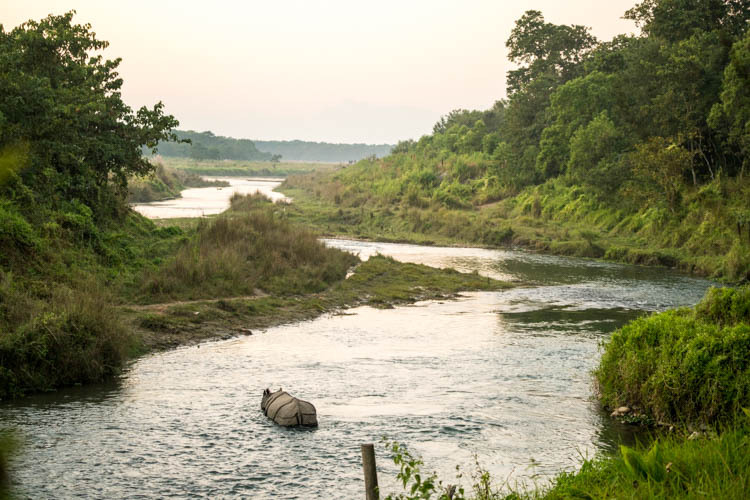 Nepal’s main rhino sanctuary, Chitwan National Park, received more than 150,000 tourists during the 2018-19 fiscal year, bringing in 167.8 million rupees ($1.52 million) in revenue. But the park is unable to use those funds to finance programs like the census. By law, half of the park’s revenue goes to local communities, while the other half goes into the central government’s general budget. Counting rhinos is not a priority for the government, which must also allocate funds for important programs related to health and education, said a former wildlife department official. Meanwhile, park authorities rely on donors like Nepal’s National Trust for Nature Conservation (NTNC), the WWF and the Zoological Society of London to finance the census. Wildlife officials are advocating for a change in policy. “As the government is working on the new budget, we are proposing that the whole process be funded by the government,” Shrestha said. A rhino takes a dip in Nepal’s Chitwan National Park. The 2015 census counted 645 rhinos in Nepal, including 605 in Chitwan. But 41 of the park’s rhinos have been found dead in the past nine months. Image by sunriseOdyssey via Flickr (CC BY-SA 2.0). The wildlife department tries to conduct a rhino census every five years to take stock of the population and devise conservation strategies, Khadka explained. The last census was conducted in Nepal between April 11 and May 2, 2015, and counted 605 rhinos in Chitwan National Park, 29 in Bardia National Park, eight in Suklaphanta National Park and three in Parsa National Park. Officials said it was particularly critical to conduct a census this year, rather than waiting until 2020 as scheduled, because significant numbers of Chitwan’s rhinos have been dying due to unknown or natural causes. In the past nine months there have been no known poaching incidents, but 41 rhinos have been found dead in and around the park. The deaths have prompted calls to assess whether Chitwan is hosting more rhinos than its ecosystem is able to support. While a shortage of funds is the official reason for the postponement, some members of the conservation community speculate that government officials allowed the clock to run out on the rhino census because they want to avoid a count that experts believe could reveal a decline in the population of the threatened species. “There are many people who claim credit for a halt in poaching of rhinos in Nepal. The issue has become a matter of prestige and no one wants to take the blame for a fall in the rhino population,” one source within the wildlife department told Mongabay. Steve Hicks via Flickr (CC BY-SA 2.0).